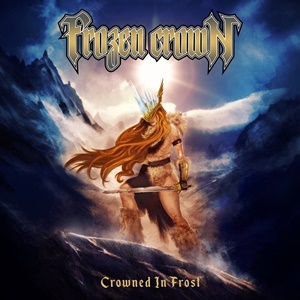 Returning for a second full-length after last year’s debut The Fallen King, Italian power metal band Frozen Crown subscribe to many benchmarks of the Euro-sound that put Sonata Arctica on the map and vaulted them to headline status. You know the deal – speedier riff fare, layering subsequent swift lick and harmony runs, while over the top you have mid-range to slightly falsetto vocal melodies as the tempos charge as if the double kick is outracing automobiles on the Autobahn. Where the quintet possibly has a variant selling point of differentiation is the dual female/male vocals within the group – Giada ‘Jade’ Etro and keyboardist/guitarist Federico Mondelli providing clean unison work at times as well as some gruffer textures beyond the normal power metal smoothness. After the “Arctic Gales” 87 second instrumental intro that gives the listener aural images of similar refrains from Metallica and Judas Priest (guitars promoting cultural melodies as the subtle drum fills follow a tribal pattern), the natural energy uplifting for “Neverending” alerts the listener that Frozen Crown mean business – Talia Bellazecca and Federico allowing the dual axe activities to cascade and encourage air simulations and thunderous headbanging. When the band choose to settle into a bit of a comfortable anthem template for “Battles in the Night”, those strong musical hooks allow Giada to glide effortlessly up and down her magnificent multi-octave range – her delivery coming from more of a power veneer and less symphonic than most others would gravitate towards. A longer epic such as “Winterfall” features some semi-blast beat and folk-like movements, Federico executing his verses with more of a raspy growl that serves as beast to the beauty of Giada – although the background unison ‘oh’ refrains and titillating 80’s-style keyboard aspects could be a crowd-pleaser should this become a part of their live show. Howling sound effects punctuate the proper atmosphere for “The Wolf and the Maiden”, a 3:31 instrumental breather before the singalong nature of the upbeat “Forever” keep that bullet train a rollin’, the chorus even bringing a bit of ABBA-class to the Sonata Arctica-ish party. We all know plenty of people who love this Euro-power metal style: Helloween started it, acts like Stratovarius, Labyrinth, and Sonata Arctica put their own stamp on things to the approval of most, and now Frozen Crown look to grab their slice of the pie for the current scene. Original this is not – fun and entertaining however Crowned in Frost will not be denied.